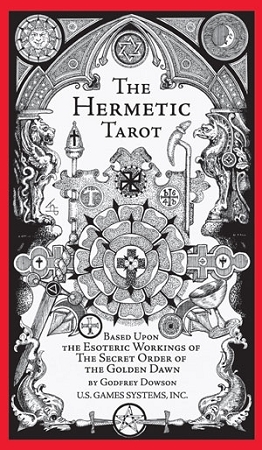 U.S. Games Systems has proudly reissued the Hermetic Tarot deck in recognition of its historical and artistic importance. The details and symbols in each card reveal many of the esoteric workings of the Secret Order of the Golden Dawn, which flourished around the turn of the century. Godfrey Dowson’s subtle black and white designs emphasize the Golden Dawn’s astrological attributes with further sephirotic, angelic, geomantic, numerical, and kabbalistic elements. All 78 cards feature an exquisite level of detail that highlights the powerful symbolism. The 70-page instruction booklet includes an introduction by Stuart R. Kaplan and card meaning written by Godfrey Dowson and Stuart R. Kaplan. The booklet also gives instructions for the classic ten-card Celtic Cross layout and presents a chart of the elemental and astrological symbols, and a diagram of the ten spheres and 22 Hebrew Letters of the of the 22 Paths of the Tree of Life.